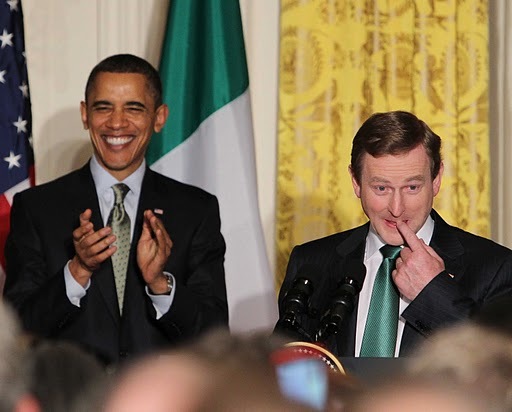 Prime Minister Kenny's St. Patrick's Day trip to the White House went very well, judging by the reaction in the American press and the way it looked on Irish TV, showing the instant easy rapport he had with President Obama. Kenny is good in that kind of situation ...he's personable, relaxed, good company, he can tell a joke and deliver a speech. So back here we're not surprised that he carried it off so well and so effortlessly. That kind of intimate, friendly setting is where he shines. His speech was poetic, moving and inspired (take a bow whoever wrote it), cleverly linking the experience of the slaves from Africa and the destitute Irish immigrants after the Famine and their joint role in building America. Given Obama's Irish and African roots it was the perfect note to strike in advance of the president's visit here in May. And Kenny delivered the speech well. In return, Obama said some positive things about our future ... and Lord knows we need to hear the positives because confidence here is at a very low ebb. Equally, Bill Clinton's Irish America magazine address last week (and there's a guy who can really deliver a great off the cuff speech) was a boost, a reminder that all is not lost, that we still have the talents that make us unique and that, in time, we can rebuild our prosperity. So yes, the uplifting words from our American friends were very welcome here last week. Boosting confidence in Ireland is important. But unfortunately the economic problems we face are on such a scale that kind and inspiring words, no matter how well meant, cannot do much to help. Equally, although Kenny did us proud in the White House last week, the fact that he is a socially engaging guy who has an easy rapport with other leaders and can deliver a prepared speech effectively does not mean that he can handle the biggest economic crisis to hit this country since the foundation of the state. The jury will be out on that one for a while. As you may know, we are now reaching crunch point with our EU partners on whether they are going to relax the terms of the bailout that is keeping Ireland afloat. Our new Minister for Finance Michael Noonan, a famously tough nut, has spelled it out for Europe and the International Monetary Fund (IMF) in stark terms. If it was just our budget deficit, then we could sort that out in a few years, painful though it's going to be, he told them. But when you add on the enormous bank debt on top of that, the situation becomes untenable. There has to be some kind of shift, not just on the interest rate we are being charged, but on the extent of the debt itself. Or to put it another way, it has to be accepted that we are never going to be able to pay all the money back. You can call it debt forgiveness or burden sharing or debt restructuring or whatever you like. But it comes down to the same thing. Europe better wise up to the fact that they're not getting all their money back. Noonan may not have phrased it as baldly as that (even if he is known as Baldy Noonan), but he has put this to the EU leaders much more directly than Brian Lenihan would ever have dared. Famous for his blunt turn of phrase, Noonan has given them the message. He has also made it clear that loading all this debt on the Irish taxpayer (thanks to the state guarantee that turned bank debt into state debt) is inequitable as well as untenable. The ordinary Irish taxpayer did not make this problem. It was the German and French banks (mainly) who were out to make a killing in the Irish property market who recklessly lent all those billions to the Irish banks to lend on to our developers. And it was the European Central Bank whose job it is to regulate the national Central Banks in European countries which stood idly by while all this was going on. It did nothing about it, even as the Irish property market expanded into a dangerous bubble and blew up. These guys at the top of the French and German banks and at the top of the European financial food chain are the ones who took the risk, not the ordinary Irish taxpayer. Yet they want the Irish taxpayer to pay the price, to carry the entire debt burden, a burden so great that it will eat up a huge proportion of our tax revenues here and leave little to be spent on getting the Irish economy back in shape again. It's true that the Irish banks behaved recklessly during the boom here and that financial regulation here was a joke. But the Irish banks were not printing the money -- they were borrowing it. The people who lent us the billions took a risk and when the property bubble in Ireland burst they lost. Now they must take the consequences of that lost gamble. They must accept that they have to share in the pain. But instead of that the French and German bondholders and banks want all their money back. The reason these banks want it all back is that they are protecting their shareholders and protecting their solvency. This thing is so big it has the potential to destabilize some of the French and German banks that gambled most heavily on the Irish market. That's why French President Nicolas Sarkozy and German Chancellor Angela Merkel are being bullish on this. They are protecting their political backs and protecting the wobbling European financial market and screwing the unfortunate Irish taxpayer to do so. Frenchman his hubris is a wonder, particularly for one who sits atop the organization which was asleep at the wheel when this huge financial pile-up across Europe was happening. And boy is he patronizing. Responding last weekend to the signals coming from the Irish government that the bank debt on top of the deficit debt will be too much to handle, he said he did not agree. He said he has confidence in our ability to take the difficult measures needed so that we can pay our debts. Well thanks for nothing, Jean-Claude. Quite by coincidence, as I was writing this column, an electrician arrived at my house this morning to fix the outside lights that did not survive the winter and are now blowing our fuses. The guy is middle-aged like myself with a teenage family and I've known him for a while. We sat down for a cup of tea in the kitchen before he started and shot the breeze about how tough the times are. He said that in spite of the construction collapse he was surviving on "bits and pieces" of work because he has a lot of domestic customers like me who still call him to get small jobs done. My electrician friend is not alone. In fact there are thousands, probably tens of thousands, who feel just like him. They feel there is no future here either for themselves or their teenage kids who will be coming out of college in the next few years. So even if they can get by at whatever they do, it's not enough. They're out of here. Why should they put German banks before their kids? We only get one life. And many people here don't want to spend it paying back the banks and bondholders who gambled their billions on Ireland and lost. It's not the fault of the ordinary Irish taxpayer. And the sooner the EU, the IMF, the German banks and the European Central Bank wise up to this, the better for us all.